Valentino Rossi took a sensational first win of 2016 with a flawless performance at the Gran Premio Red Bull de España. With the three biggest names in the MotoGP™ World Championship all starting on the front row of the grid, the Spanish GP was set to be a very special race. 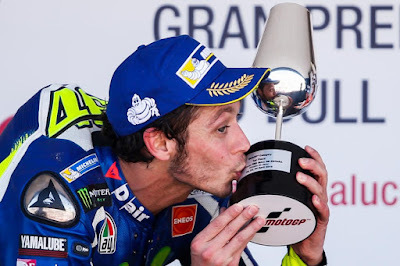 For Valentino Rossi, who started on pole position, it proved to be one of the most dominant of his career. A perfect start saw ‘The Doctor’ lead the race from the word go, his Movistar Yamaha MotoGP teammate Jorge Lorenzo applying pressure in the early laps. His start was so strong, that Rossi was almost unable to believe it himself as he set low 1’40 after low 1’40. Rossi was able to withstand the pressure of Lorenzo and a run of fast laps saw him open up a gap of over three seconds. On lap three Rossi managed a 1’40.090, the fastest lap of the race. Towards the end of the race Lorenzo tried to closer the gap but was forced to roll off, Rossi cruising to his 113th career victory, his 87th in the premier class. This may have been his 87th victory, but it was the first time he had led every lap of a premier class race from pole position to the finish. Even at 37 years old, the Italian is still learning. The victory came as a culmination of hard work across the weekend, he and his team pushing in every session to understand what the tyres were capable of. After his disastrous DNF in Austin, Rossi has recovered his lost momentum and closed down his rivals in the championship. Thanks to Sunday’s 25 points, Rossi now sits third in the MotoGP™ World Championship standings with 58 points just seven behind his teammate. The gap to Marc Marquez (Repsol Honda Team) at the top is still significant, 24 points the difference. Once more it seems Lorenzo, Marquez and Rossi are the three title contenders and as 2015 proved, it’s a long championship and 24 points can quickly become zero with just a small mistake. MotoGP™ riders will be back on track in Jerez on Monday for a day of testing. I think that this was the perfect weekend. We started to go faster from Friday morning and we worked very well.